Garlicky Grilled Shrimps matches with Sfriso Rosè, of course! 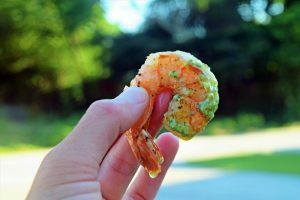 If it’s Rosè time, then it’s Garlicky Grilled Shrimp with Oregano & Lemon Pesto Butter time! Here is our new recipe to pair with our Sfriso Rosè! In a small saucepot, heat the oil over medium-low heat and add the smashed garlic. Cook until the garlic is golden brown on both sides, and then remove each clove with a slotted spoon. Cool the oil to room temperature and divide into two portions. Butterfly the shrimp by making a slit in them lengthwise. Thread the shrimp onto skewers and then brush them using the first bowl of garlic oil and season generously with salt and pepper on both sides. Grill the shrimp until opaque, about 1 1/2 to 2 minutes per side. 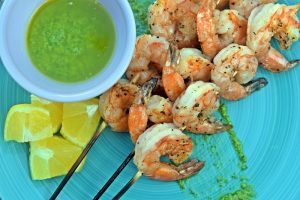 Using the second bowl of garlic oil, brush the cooked shrimp again and then arrange the skewers on a platter. Garnish with lemon wedges and serve ramekins of the Oregano & Lemon Pesto Butter alongside for dipping. In a dry small skillet, toast the pumpkin seeds over medium-low heat, tossing frequently, until lightly golden and very fragrant, about 5 minutes. Immediately remove the nuts from the pan and transfer to a bowl to stop the cooking process. In a food processor, pulse the pumpkin seeds, garlic, and a generous pinch each of salt and pepper until the seeds are broken down. Add the parmesan, oregano, basil, honey, and lemon zest and juice and pulse until thoroughly combined. With the motor running, stream in the olive oil a little bit at a time until the pesto is velvety. Place the pesto in a deep bowl and slowly whisk in the melted butter until thoroughly combined. Season to taste with additional salt and pepper if necessary. Recipe and photos developed by Fanny Slater, winner of the Rachael Ray Great American Cookbook Competition!